Oxford University Press, USA, 9780199756247, 264pp. Known as "the queen of the platform," Ernestine Rose was more famous than her women's rights co-workers, Elizabeth Cady Stanton and Susan B. Anthony. By the 1850s, Rose had become an outstanding orator for feminism, free thought, and anti-slavery. Yet, she would gradually be erased from history for being too much of an outlier: an immigrant, a radical, and an atheist. In The Rabbi's Atheist Daughter, Bonnie S. Anderson recovers the unique life and career of Ernestine Rose. The only child of a Polish rabbi, Ernestine Rose rejected religion at an early age, successfully sued for the return of her dowry after rejecting an arranged betrothal, and left her family, Judaism, and Poland forever. In London, she became a follower of socialist Robert Owen and met her future husband, William Rose. Together they emigrated to New York in 1836. In the United States, Ernestine Rose rapidly became a leader in movements against slavery, religion, and women's oppression and a regular on the lecture circuit, speaking in twenty-three of the thirty-one states. She challenged the radical Christianity that inspired many nineteenth-century women reformers and yet, even as she rejected Judaism, she was both a victim and critic of antisemitism, as well as nativism. In 1869, after the Civil War, she and her husband returned to England, where she continued her work for radical causes. By the time women achieved the vote, for which she tirelessly advocated throughout her long career, her pioneering contributions to women's rights had been forgotten. 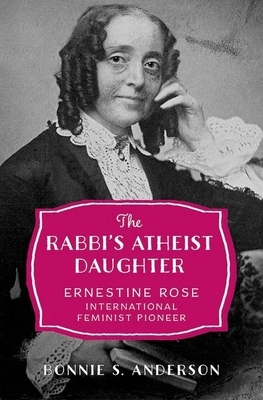 The Rabbi's Atheist Daughter restores Ernestine Rose to her rightful place in history and offers an engaging account of her international activism. Bonnie S. Anderson is professor of history emerita at Brooklyn College and the Graduate Center, CUNY. She is the author of Joyous Greetings: The First International Women's Movement (OUP, 2000) and co-author of A History of Their Own: Women in Europe from Prehistory to the Present (OUP, 2000).